Published on Mar 21, 2019 at 07:58p.m. 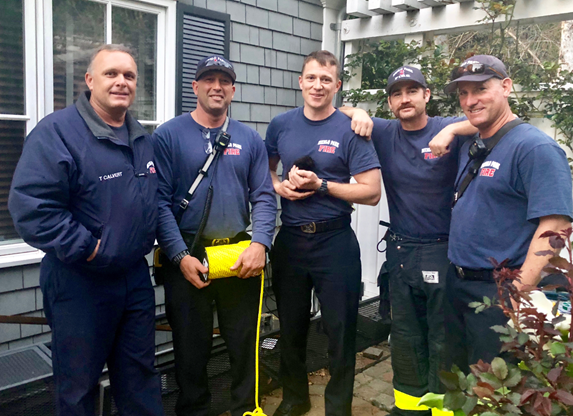 At 4.29 pm Friday afternoon, March 15, 2019, Firefighters at Menlo Park Fire Protection District’s Station 3 were contacted by an Atherton resident who lives on Selby Lane. The resident said she had heard a baby Kitten crying all morning and upon further investigation realized that the Kitten had somehow slipped down into an exterior water drainage pipe. Captain/Paramedic Mike Harrington, Engineer Joey Quadt and Probationary Firefighter Ryle Fitzgerald on Menlo Engine 3 arrived on-scene at the home at 4.36 pm. 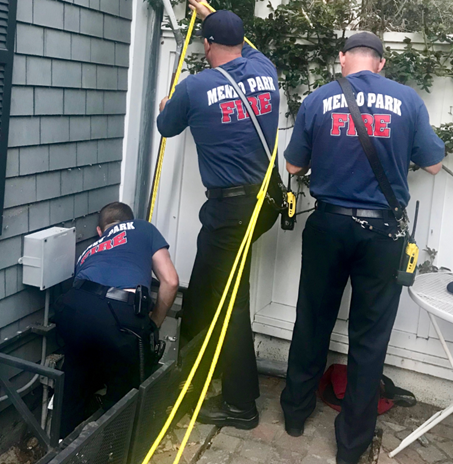 Firefighters located a 4 inch in diameter exterior water drainage pipe directly next to the homes foundation used to collect rain water from a roof top gutter downspouts. It was difficult to angle in and see down into the dark pipe because it was up against the house, so Firefighters used a cell phone with its light on to shoot both video and photographs and then rewind and review the video and use the zoom in feature to look down into the pipe using the photographs. What they found was troubling and not encouraging at all, the top of a black Kittens head was barely visible, worse yet the pipe went straight down vertically and the Kitten was at least fourteen feet below a solid concrete walking deck. San Mateo County Animal Control was requested to respond and arrived at 5.16 pm and Captain Harrington turned the call over to them. At 5.53 pm Animal Control Officers requested that the Firefighters return to the scene. The crew of Engine 3 returned to the scene at 6.10 pm accompanied by Menlo Battalion Chief 1. The Animal Control Officers had been un-successful in being able to reach and capture the Kitten with convention snares and other equipment. Firefighters initially used a ½ inch rescue rope line specific too human rescue and recovery operations, which was problematic in the 4 inch opening and ultimately failed. Engineer Quadt and Probationary Firefighter Fitzgerald then constructed a noose system using twine and began to use fishing line techniques, rapidly moving the line up and down using in a bobbing method. This continued for almost an hour when Captain Harrington decided to discuss other more aggressive options and/or abandoning the operation entirely with the homeowners. Suddenly, Fitzgerald said “hey, I think I got it” he then slowly and carefully pulled the line upward, capturing the Kittens head and arm, pulling it from the pipe moments later. 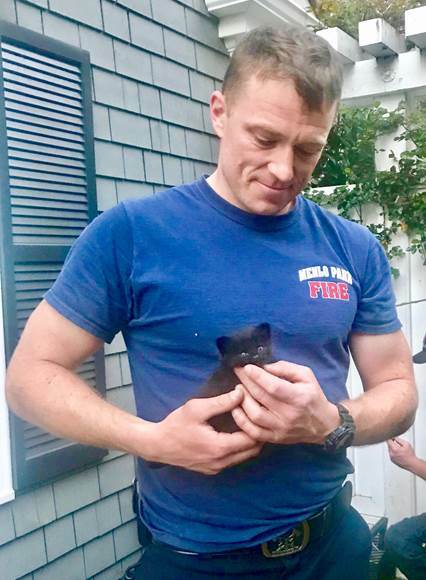 The Kitten was named “Ryle”, after its rescuer and Probationary Firefighter Fitzgerald was dubbed “the cat whisperer” by his fire crew and Animal Control Officers. Fitzgerald is currently contemplating adoption of the Kitten. Fire Chief Schapelhouman said “it’s always nice when we can share a positive conclusion to any type of interesting and complex rescue we perform with the general public. It’s amazing all of the strange predicaments both humans and animals can get themselves into. Just when I think we’ve seen it all, something new comes along”. All Fire Personnel cleared the scene by 7.30 pm and all units remained available for priority emergencies during this incident.